Want More FBG? We Have a Free Android App for That! Online classes? Twitter workouts? Virtual weight-loss programs? And now an Android app? FBG is going all 2012 on you! Over the past year or so we’ve gotten quite a few requests to create a Fit Bottomed Girls’ app, and now it’s finally happened. We’ll confess, it’s nothing insanely new or different, but it is a way to get FBG content no matter where you are or what you’re doing. There’s a bit on the mission of FBG, our latest videos, links to chat with us on social media and a running feed of the latest posts on the site so that you don’t miss a single one. In addition, see the barbell at the top right of the image? That’s a cool little button you can hit to submit your fitness truth (remember those?!)! When you enter yours in, it’ll come straight to our email inbox, and we plan to highlight our faves on the site from time to time in special posts. 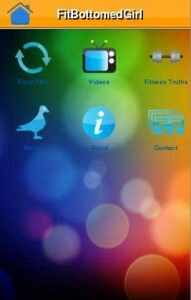 So whether it’s your fitness truth for the year, month, day or hour, download this free app and keep them coming! I am so glad you finally came out with an app I’m addicted to your site and now I can go on it anytime 🙂 you guys are awesome thanks for all the helpful info you give!!!!! Where is the iphone one?! We need some love too.